Media captionFire engulfs Glasgow School of Art. Flames ripped through the celebrated Mackintosh building after it caught fire at about 23:20 on Friday. 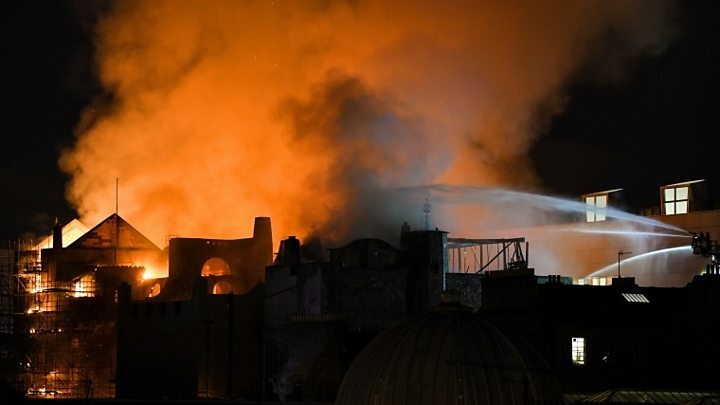 The blaze spread to nearby buildings, including the Campus nightclub and O2 ABC music venue, which suffered "extensive damage". The renovated Mackintosh library had been due to reopen next year. It was destroyed in the blaze that ripped through the building in May 2014. It was being restored in a project estimated to cost up to £35m. The Scottish Fire and Rescue Service's Deputy Assistant Chief Officer Peter Heath said the fire damage was "exceptionally significant". He said it was likely that all the restoration work carried out since the last fire had been destroyed. About 50 firefighters were still tackling Friday's blaze with nine fire engines and four-high reach appliances at the scene. A spokesman said the blaze had now been largely contained, however, a few pockets of fire remained. Unlike four years ago, art students were not using the now fire-ravaged building for their degree work. An exhibition by graduating students took place at the nearby McLellan Galleries and the school of art's Reid Building. A statement from the school of art described the fire as "devastating". It added: "The Glasgow School of Art's immediate focus is on our students, and on the continuing operation of the GSA to ensure minimum disruption to students and staff. "The GSA and all of its buildings will remain closed for the next week, and we will provide updates as and when information is available." Fire crews are concentrating efforts on all four sides of the buildings, from Dalhousie Street to Sauchiehall Street and into Renfrew Street. Nearby homes have been evacuated as a precaution. There are not thought to have been any injuries. At its height, a total of 120 firefighters and 20 fire engines were at the scene. SFRS area manager David Young said: "The fire has now largely been contained but this remains a protracted incident and our efforts very much continue at this stage to extinguish the fire and ensure the community is protected. "There will be disruption around Dalhousie Street, Sauchiehall Street and Renfrew Street and I would advise the public to avoid these areas at this present time. Firefighters sent to the scene had been faced with "an extremely challenging and complex incident", Deputy Chief Officer Iain Bushell said earlier. All floors of the building were affected. Firefighters used water from the River Clyde to tackle the blaze, resulting in a number of road closures in the area. Insp Catherine McNally, of Police Scotland, praised the response of both the public and nearby licensed premises which were asked to evacuate. Parts of Glasgow's Sauchiehall Street look normal for a Saturday morning. The rain falls heavily on top of chip boxes, the remnants providing breakfast for many a hungry bird. But the presence of fire engines, police officers, bewildered passers-by and an acrid smell of smoke in the air indicate this is far from normal. Smoke still billows from the Glasgow School of Art, the Campus nightclub and the O2 ABC venue, with all the streets around the area closed. Once again, the people of Glasgow are watching on as one of its most famous buildings is on fire. Once again, the words "so sad" are heard on every corner. Water is still being pumped onto Glasgow School of art this morning, though firefighters now say they have contained the blaze which has so extensively ravaged the Mackintosh building there may still be pockets of fire flaring up. The operation on the ABC building next door they still describe as active firefighting, the fire spread to the roof of that building though it's smoke more than flames visible from the street, now. 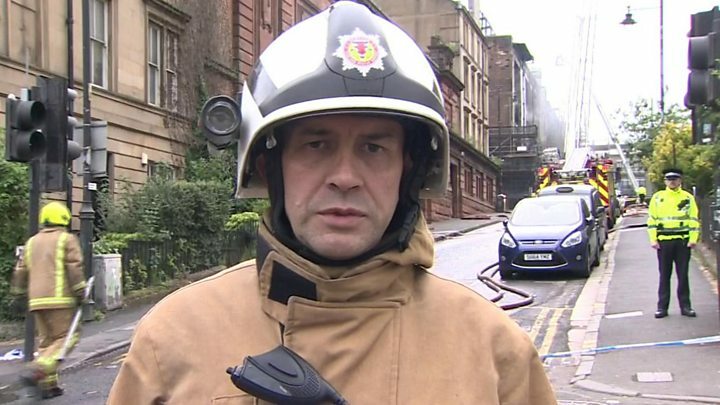 Deputy assistant chief fire officer Peter Heath says there is damage to every part of the Mackintosh building, and the fire had such a grip of the building when they arrived here just after 23:15 last night, that they don't know where it started let alone how. Initial impressions are that it seems unlikely that any of the restoration work carried out since fire ripped through the building four years ago, will have survived this latest blaze. Stuart Robertson, the director of the Charles Rennie Mackintosh Society, said the second fire was "unbelievable". "It is like deja vu from four years ago," he said. "Last weekend was a joyous occasion, we were celebrating Mackintosh's 150th birthday and the rebirth of the Willow Tea Rooms in Sauchiehall Street, the Hill House in Helensburgh is about to have major restoration and we were looking forward to the reopening of this building after four years since the last fire." Mr Robertson said he had been in the building a few weeks ago to look at how the restoration was progressing. He said the famous "hen-run" had been restored, work on the library was well under way and the studios "looked amazing". "This is like a nightmare," he said. "I can't put into words how heartbroken I feel." Nicola Sturgeon said the Scottish government stood "ready to provide any support" in the wake of the blaze. She said the government's resilience room was activated as the fire developed overnight. Paying tribute to the fire service and other emergency services, the first minister added: "This is a very sad morning in the city of Glasgow." "This is clearly an extremely complex and large-scale incident, and one that is ongoing," she said. "I would like to thank the emergency services for their continued efforts. "The Scottish government stands ready to provide any support that may be required, now and in the period ahead." Secretary of State for Scotland David Mundell, who had visited the building only two weeks ago, said he was "devastated". Scottish Labour leader Richard Leonard said "hard questions" needed to be asked as to why and how the building has suffered two serious fires in four years. He said: "In the meantime, we can be relived that there appears to have been no serious casualties."